Color(s): White with any combination of lemon, orange, tricolor, or grizzle markings. This breed was created in 16th century. They are specially created for hunting and are great hunting dogs. They can hunt in any type of weather. They are relatively new and is becoming famous in the united states. The Petit Basset Griffon Vendeen are solid, capable, breezy and bold. Petit Basset Griffon Vendeen is also active, alert, and robust. They are adventurous. They seek human attention. They are wise, cute and determined. They do well with other dogs, cats and other pets. They also do well with children and strangers. They can be destructive if bored. 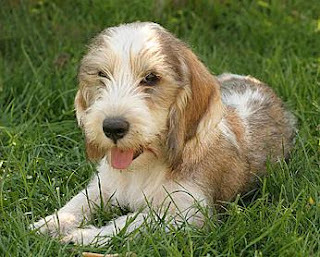 The Petit Basset Griffon Vendeen is a double coat dog breed. The outer coat is harsh, wiry. The inner coat is soft and provides warmth. This breed sheds little to no hair. They are easy to train. Training should be done with firmness, honesty, calmness, same and awarded. Exercise is necessary for them. Apartment life is okay for this dog breed. If left in a yard that must be securely fenced. Weekly brushing is advisable to remove dead hair. Bathing should be done only when necessary for this dog breed. Like all other dog breeds out there the Petit Basset Griffon Vendeen is also prone to some health realted problems and dog diseases the ones specific to this dog breed are eye abnormalities, aseptic meningitis, epilepsy, hip and elbow dysplasia, patella luxation, hypothyroidism, and food and skin allergies.